All Seniors and many Juniors go to prom. But is that a must? Is it a “for sure”? What if your Junior’s grades have tanked? What if your Senior, suffering from “senioritis,” is all full of themselves and has been disrespectful toward teachers or you? Simply put, I have lost my !’s. It happened sometime in the last 3 months. I stopped feeling it, and next thing I knew it was lost. The ! was lost. My father in law had a gift of using !’s. There were times when we would count up to 20 in a note. He saw life from the glass half full perspective. Very positive. Even when there wasn’t much to be positive about. I use to be that positive. There are moments and days when I feel it yet. But right now, no !’s. I’m looking at life more as a glass tipped upside down, spilled all over the floor perspective. My son Michael recently informed me that when I don’t use an ! in my texts it changes the whole tone of the message. Funny Mike. I understand that. Right now, when I say “I’m coming to see you in Madison.” that is how I’m feeling it. There isn’t an ! behind the words. Yes, Mike I know it’s blah sounding. But more so, it’s really sad. I think the downward spiral started when I realized I was 50. Now that was a few months past my 50th bday. Overnight, everything started going south. I mean gravity set in. Aches and pains are not going away. My brain is mush. I’m doing crossword puzzles for goodness sakes just to keep my synapses connected. Then stuff just happens. Parenting young kids stuff, our marriage stuff – that sort of thing. I was fighting for my !’s at that point. Keeping my spirits up. But nothing improved. The last straw that caused the cessation of !’s in my sentence structure was having my kids move away. The four big ones. And the special little grandson, Josh. God never said we weren’t suppose to feel our pain. By feeling it though, you can so a bit, lose your enthusiasm for life. In my case, my loss of !’s is indicative of that. As I deal with this season of life, I have cried out to my Father in heaven, “What am I to do with this grief? I’m good with you using my kids. They are yours after all. But what do I do with the pain caused by their absence?” Audibly I heard, “Feel it.” Ooooh, but to feel it, I have to feel it. And that hurts. Isn’t it easier to deny it? Shove it aside, get busy doing other things? There is merit in doing that, and it is essential at times. Stuffing just isn’t a good thing to do. It can eek out at the worst of times. My Father in heaven is so patient with me. After I throw a bit of a hissy fit, for months at a time, I hear Him say -yeah I’m one of those who think God speaks to her directly- “Ok…time to move on. I’ve let you kick and cry long enough. Take my hand and let’s see what lies ahead.” Like a really good Dad, he urges me forward. If I don’t go with him, I will get stuck and who knows for how long. Being stuck just isn’t living life the way it God intended. As I find my new normal in life, walking along with my Father, I just might find those !’s again. Yeah…I know I will. For now ~. When I was a 19yo, I married and moved away from my family. Far away. Farther than any of my siblings. I left a family where we would enjoy getting together for family dinners. My sibs who all lived within 80 miles of my parents home would come with their kids. Aunt Karen loved to have them around. 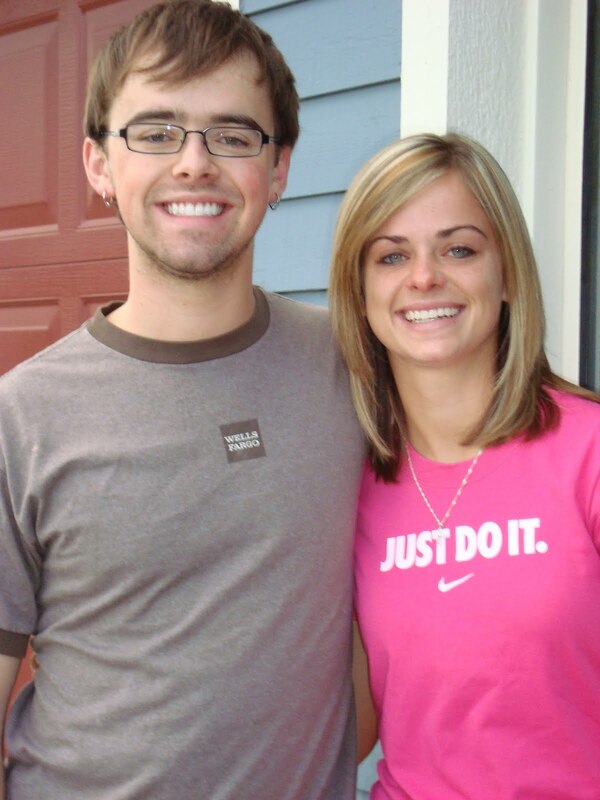 See there was 7 years between myself and the next oldest sib. The original four are pretty close in age. Then there was me. Those dinners were all the more meaningful to me because of that. There was no email telling me so, but when God called us away and kept us away, I felt he might keep my own family, my kids and theirs near me. Say an 80 mile radius? It is not meant to be. How about a 950 some mile radius instead? With that sort of drive, no one is going to be popping over for dinner every week. Not every month. Maybe once a year. I haven’t spent any time asking why. To me that’s just unnecessary. God sends, you go. But can I have a bit of a pity party? This really stinks. I have grown to love certain things about Denver, but I’m not in love with Denver. Obviously my kids aren’t either. They are all back in the midwest where they started! Of course as my son once pointed out “Mom we came to Denver so we could adopt the girls.” Our three youngest. For those of you who know me, this hasn’t been a great selling point; but when God says step out in faith, you step out in faith. We were on track to be young grandparents. Then infertility hit my daughter and it took a few more years than planned. Ok. Now we are blessed with little Joshua and what? Move them away? They lived in a 15 mile radius! Even better! Now they will be the farthest in Madison,WI. It just doesn’t seem fair. There is no lesson to be learned in this blog. No moral of the story. Just hurt. I’ll deal. Have to. Christmas is one of my favorite times of the year. I love hanging lights, which has become an event with my kids. What a blessing to have them willing to help me! What other time of year to do you totally redecorate your home for one month! Kinda crazy actually, but still I love it. So when this year, as the big day draws near, my kids are coming to town, what should happen but a crazy thing like Bells Palsy! What on earth! Wake up one morning and I’m having trouble drinking my coffee! Next thing I know I’m feeling numb around my eye, down my cheek, throat, neck and tongue. My nurses mind kicked in and I thought I had a brain tumor! No stroke..I know what that would look like! But I had had a viral infection for the past couple weeks, and that is a precipitating factor. I am grateful that it is minor. You couldn’t tell to look at me. Other people have a major drooping of their face. Only when I talk, eat, or drink is it noticeable. I have major eye pain is the problem. My new mantra is “What timing! God I need you to help me through this. Help me rise above.” What a difference it makes. He is my ally after all. He created the world not to be like this. It was suppose to be blissful. We are the ones to mess it up. Thus I have a weak body, one that I sometimes I wear down by doing too much. I live in a broken world where illness and tragedies occur. When I look at life this way, it’s so calm. Am I bummed? Oh yeah. Being on prednisone is causing me to be kinda crabby and awake all night. Am I sad that it might affect my time with my kids home from MN, you bet! But with God as my partner, not the one inflicting this on me, I can overcome the earthly struggle I have encountered. I feel His encouraging presence. And what a minor thing it is. As families face loved ones missing, others grieve the loss of loved ones lost in the past. Families have loved ones over seas serving our country and the people of the countries in which they serve. Yeah, mine is rather insignificant. It’s not to make myself feel guilty for my feelings, but it puts it all in perspective. How could that be? A person in a family of 11 feeling lonely? It’s how you define lonely. Physically there is pretty much always someone around me; a lot of weeks, 24/7. I’m not talking about physical loneliness. Emotional loneliness. To me it’s worse. To physically have someone around you but emotionally they are vacant is something that I find devastating. Strong word. This state of being has caused personal devastation in my life. It has robbed me of who I really am. I have lost that person. My mission is to stay above water. Keep things functioning. I find myself retreating from life. Participating in less all the time. What makes it all feel like I’m the one going crazy is, the people that cause me to feel this devastation, to others appear normal. Helpful. Successful. Sweet. Generous. There are times that I see that. It doesn’t last. Don’t trust it. It will most certainly bite you in the rear if you do. I’ve been bit. Many times. Talking in such generalities, confirms my craziness. And yet my examples of the oddities that go on in my house make others say, “she’s crazy. That happens in my house too.” When I say it’s different, I feel as if I’m not being accountable. That I’m blaming others. That I think what I have to deal with in life is “special.” But it is. I didn’t have this going on in my home when my biologicals were young. There were other stresses, but not the kid crazies I deal with now. I know normal and I know weird, and my life is on the weird side now. The other night, my three adopted and I were home alone. I went out on the back porch to care for my dogs, and when I attempted to enter the house again, the door was locked. No biggie. Or so one would think. I knocked on the door. Banged on the door. Pounded on the door. Kicked the door. I shouted and banged some more. All of a sudden the youngest shows up in the kitchen and goes right over to…the computer which she had been working on. I banged again and had to ask her to come to the door to let me in. When asked if she heard me pounding on the door, she replied, “Yes.” Daughter number 2 appears. They had been together. When asked the same question, she replied, “Yeah I heard you, but I thought you were pounding something up here in the kitchen.” Legit you might say? Really? Imagine you are in your home and you hear regular, hard pounding going on and it isn’t stopping. You would go find out what is going on. Let’s say Tara, or Molly had been there. They would have eventually thought, “Something isn’t right.” These two, didn’t cross their minds. Not to mention number 1 who was in the shower, and never came down to say even later, “What was all that pounding.” Emotionally vacant. In comparison, today, #1 tripped over a cord, didn’t fall, didn’t hit anything, and daughter #2 responded instantly with “Are you ok? !” ???????? On a regular basis right now, #1 chooses to not communicate with me in what I would consider “normal.” We are setting the table and she asks randomly, “What is colon cleanse.” WHAT? Today, I ask her to get the bleach cleaner from under the kitchen sink. She shows up with a different one, and says “I found the bleach cleaner.” I asked was this the one under the kitchen sink? “No.” How could you have communicated in a better way? “I could have said, Mom I couldn’t find the bleach cleaner under the kitchen sink, but I found this in the other bathroom. Is this ok?” So she knows how to communicate, she chooses not to and keeps us at odds. That is the goal of an adopted child. To keep you at a distance so that they don’t bond with you. To bond with you would subconsciously cause them death. You might say, Karen don’t let her do that. Who cares. Don’t let her get to you. Understand why she does it and deal with it. At times it’s constant. There isn’t a moment right now when she comes up and says anything to me that makes much sense. Would you let someone keep punching you over and over and say, just ignore it and it will go away? Of course not!!! I’m human, and I’m not always able to over come this garbage. It doesn’t stop with my adopted. That’s what is so hard. There are the same communication problems with another one in my home. But if I talk openly about that I would be accused of any number of things. From being mentally unstable, to hypercritical, to being a terribly angry person. These things have all been said to me, and about me by this person I am suppose to be emotionally connected with. Yet on another day, I’m the most wonderful, loving, supportive person in the world; those are the days I don’t say anything despite the crap going on all around me. Keep quiet and keep peace. This all creates a place of emotional nothingness. I am numb and don’t know what to do about it. Now being a Christian, of course I know I’m not alone. I don’t need to be told that. I need to vent. I need to talk about this and not worry about not being spiritual. God can deal with my frustrations and my truth about them. Can others? 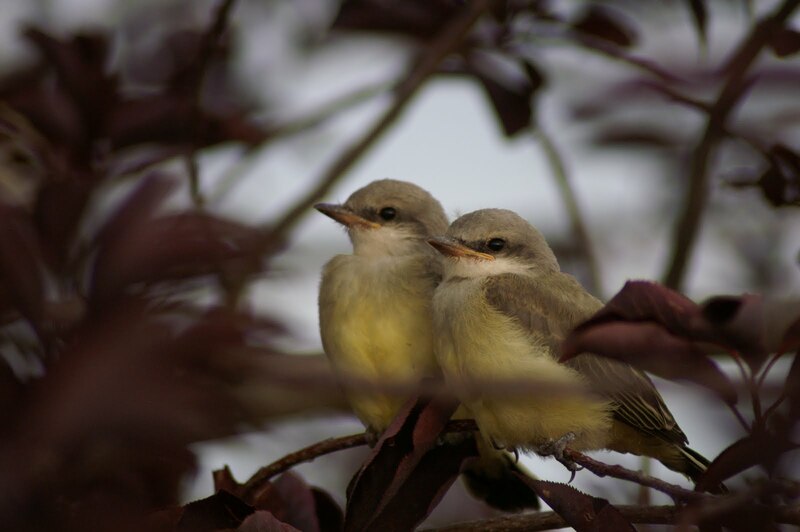 This summer I have watched two different species of birds and their young. As a child I could never understand my mother and grandmothers fascination with birds, now I have the same afflicition. My kids are not quite sure what to do when I drag them out to see the latest in the baby meadowlarks progress towards adulthood. They indulge me while walking away shaking their heads. 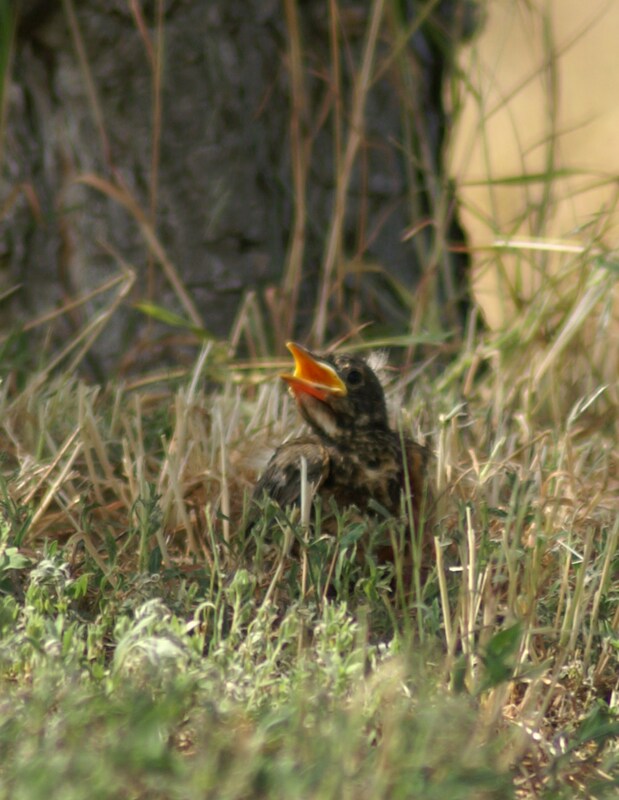 The first observation of the season was when we saw a baby Robin laying on the ground. We had some horrible storms this summer with furious winds and hail. Maybe he had been blown out. I asked John to Goggle the question, “Will a momma bird reject her baby if it’s put back in the nest by a human?” With computer always at his side, he goggled. Did you know that birds don’t have a sense of smell, so thus they could not “smell human” on their babies thus causing them to kick the kid back out? The things you learn!! 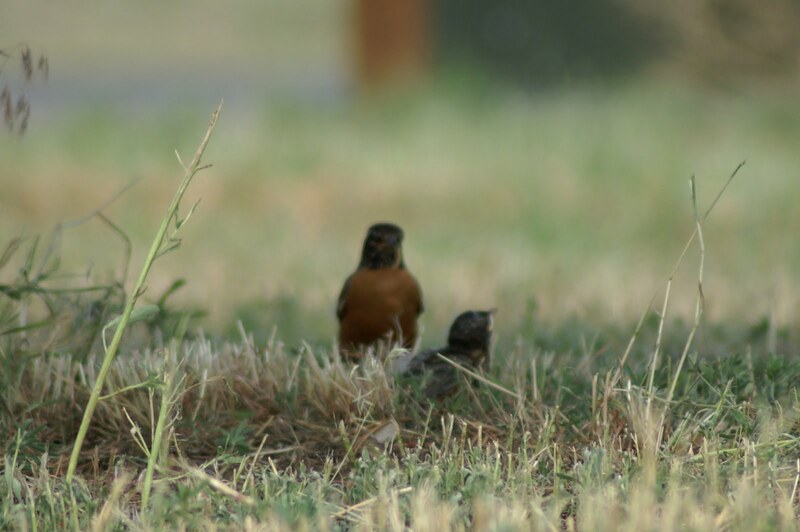 However, the American Robin does continue it’s training of it’s young on the ground! Another amazing fact!! Sure enough the momma Robin was close by looking at us rather impatiently with food in her mouth. But she was also concerned about someone that was near by…. After shooing the snake one way and the baby the other, we backed off and watched. Soon the mom brought the food to the baby, who gobbled it up, hopped after her a ways, then mom flew off again. I continued my study like one of those nature guys on tv. Camera in hand. The little one was now taking shade under one of the big pine trees in our field. Mom was across the street in an open field hunting. Once again, baby and mom communicate, mom arrives to the youngester’s new spot, and brings another tastey morsel. Fascinating. This newly acquired knowledge was confirmed the next day when on the farthest, opposite end of our property, I found another mom Robin on the fence and after listening, found another baby Robin hiding in the weeds. On occasion we have had Western Meadowlarks nest in our trees out back near our patio. They will loudly protest as you come near “their” tree. Sometimes they will even dive bomb you to get you to move on. We had a nest this year with three babies. One was lost to the wind and hail. 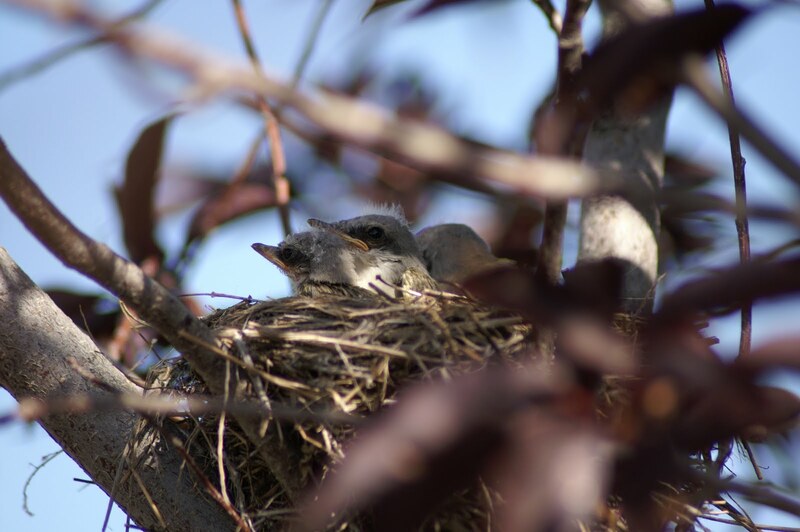 We watched the other two grow from fuzzy blobs poking out of the nest to little birds sitting on the branches of the tree. Over several days I watched them come and go, learning to fly from “their” tree to another, to the fence post, and back to “their” tree. The whole time, mom and maybe dad were near by, scolding me for getting too close, and bringing them snacks along the way. I can not lose the analogies to parenting our own children here. 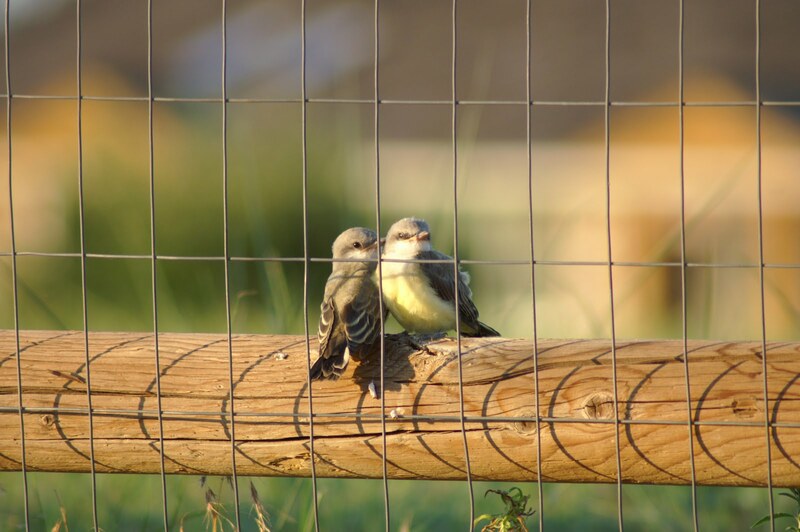 As these birds did, we spend our time feeding and caring for our kids and encouraging them to take those next steps of maturity. Yes we do squawk at them now and then when they don’t see the dangers we do. And now and then we have to intervene and ward off those that would like to harm them. 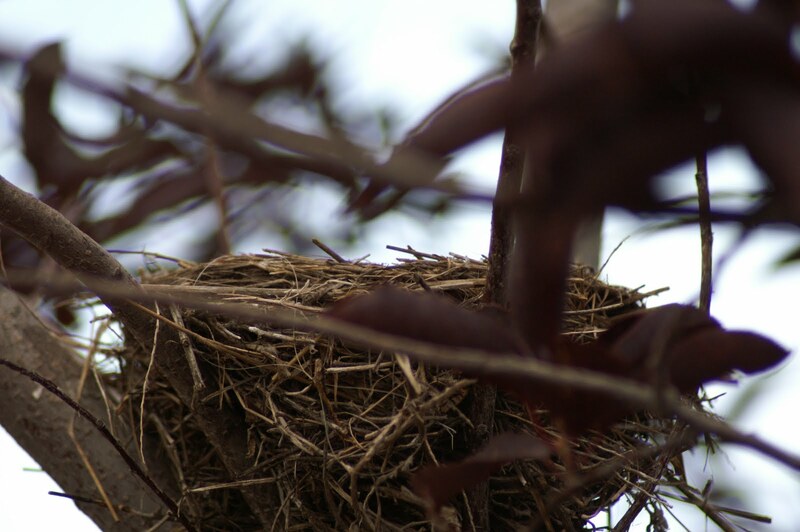 Of course it takes years of prep before our kids are ready to move out of the nest. Then the day comes and they are gone. All grown up! Flying away. For now, they are flying to and from the nest. This provides the weaning process for mom! 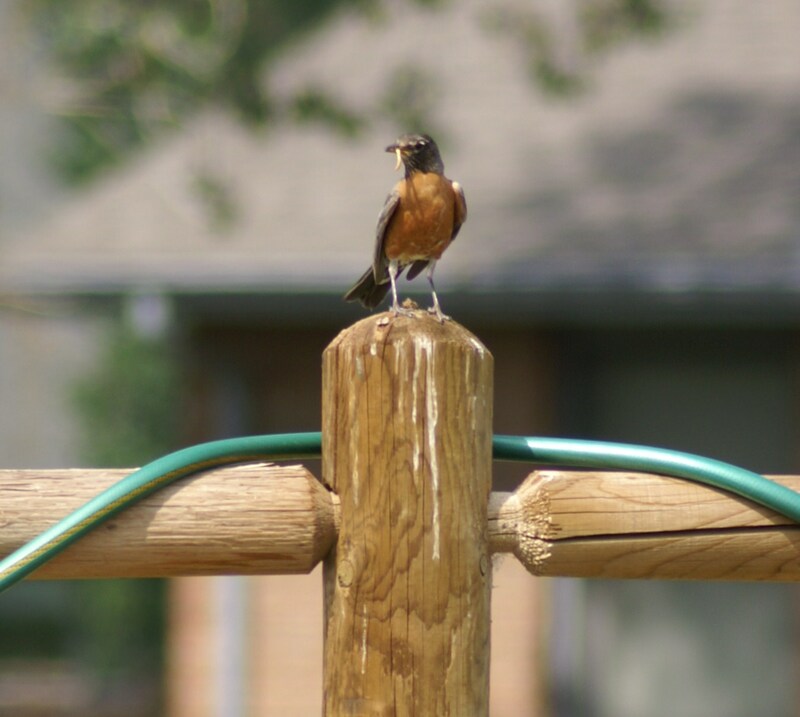 But for the most part they are out on those fence posts and nearby trees. It makes this nest feel quite empty. There isn’t a crazy boy coming into the house causing lots of noise and yes, laughter anymore. I expect to see him in the drive thru up at Wells Fargo in Brighton, but he’s not there. The presence of my techno color Molly is missed. The constant, yes constant sharing of stories which was part of my life for so long, has now gone quiet. I won’t be able to walk into my local Starbucks anytime soon. She’s not behind the counter anymore wearing her headset and apron. Yep, the nest is feeling pretty empty. I am at a turning point in my life. One of those developmental stages. Did you know they continue beyond the baby years? Yep. I am at the redefining your life stage, (my own definition). For 26 years I have been known by whose mother I am. I am Kristin, Tara, Michael, Molly’s mom. I am John Miller’s wife. WAIT!!!!!! I’m Karen. Karen Giles. Who is she? Where did she go? She was a separate person at one time. Then she became known by all these others peoples names. She became lost in what she was doing. Not bad. A developmental stage of its own. It’s time to find her again. I’m not sure I can.